The highly-spec'd Alcatel Idol 4 Pro is a beast of a Windows 10 Mobile phone. For those who are not fans of the Lumia line, this device should satiate your craving for a non-Microsoft flagship Windows 10 Mobile handset. The model supports Continuum and is expected to feature a 5.5-inch to 6-inch display with a resolution of 1080 x 1920, according to GFXBench. The Snapdragon 820 chipset is under the hood along with 4GB of RAM and a 21MP rear camera. The Idol 4 Pro has now been Wi-Fi certified, and we can see in the documentation that this model is headed for T-Mobile. The model, number 6071W, is the same exact one that was benchmarked by GFXBench. Back in March, just after the GFXBench story broke, there were reports that a 'mini' version of the phone is also in the works. All we know at this time is that the full-sized version of the Idol 4 Pro is running through the checklist on its way to the house that John Legere built. Along the way, we should see the handset take its high-spec'd self and trot on over to the FCC for certification. Cant wait to see this at my t-mobile store. What a waste of expensive hardware and naive thing to think that hardware will matter on Windows platform. Totally, they should only make phones for Android! They are making so much money doing that./s Alcatel knows a lot more about market awareness than some forum poster ever will lol. Besides, there are more than enough Android phones in the world, time for some OEMs to get in on Windows Mobile for a change. 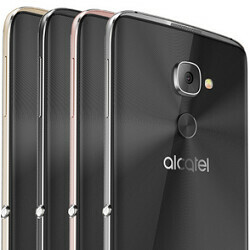 Though I like Alcatel Android phones I sincerely doubt this phone will grab any substantial attention. While Android market is saturated Windows platform being fled by developers and even die-hard fan base. It's like trying to make a baby with a dead person. Talk about waste. As a proud Windows user, you're a waste of sperm. And a good day to you proud Win user. Does it mean that Alcatel´s windows flagship with full HD will have much faster processor than their android flagship Idol 4s with QHD?? The idol 4 and 4s did not launch. I was searching today ironically. It says coming soon on every site and it has been announced in February. Could rival the Moto g4 / 4 plus so I wonder if they'll release it. The Moto g is overheating so I cross that out.